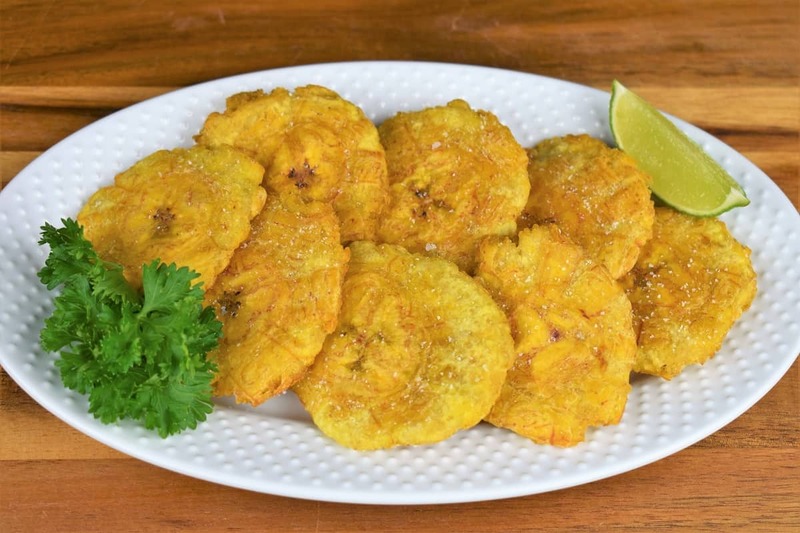 There are a few side dishes that are classically Cuban – and tostones are one of them. Tostones are fried green plantains; actually they’re twice fried green plantains. 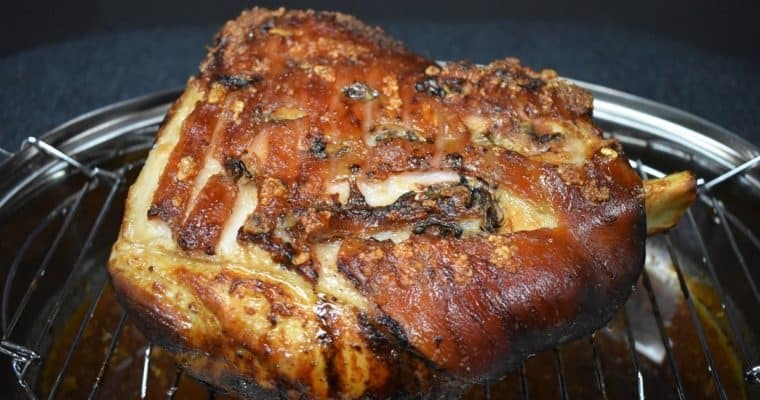 They’re really good with all kinds of dishes, whether Cuban sandwiches, bistec empanizado or arroz con pollo, a side of tostones won’t disappoint. Enjoy! Peel the plantain by cutting off the ends and running a knife tip down the plantain, scoring the peel. Using your fingers, get under a piece of the peel and pop it up. 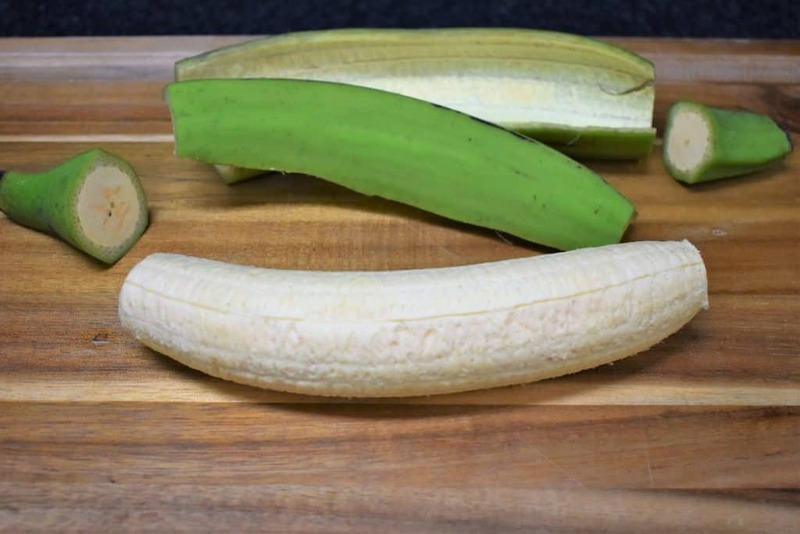 Once you get a piece started, the rest of the peel will be easy to remove; just keep running your thumb or finger between the peel and the plantain. If your fingers get a little stained, don’t worry, it comes off with washing. 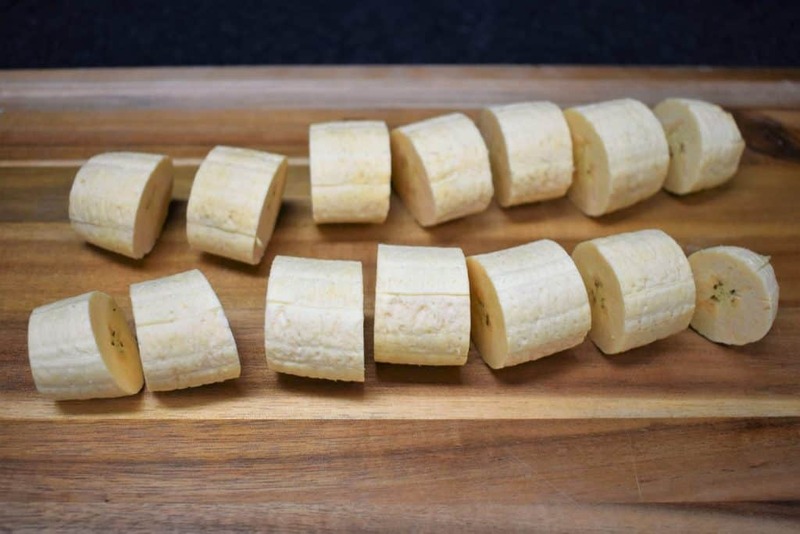 Cut the plantain into roughly 1-1½ inch pieces. 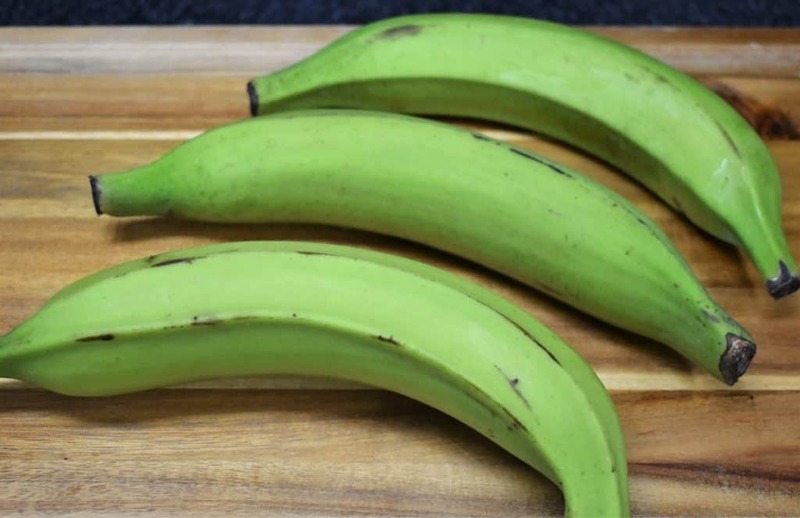 You should get 5-7 pieces from each plantain – depending on how big it is. 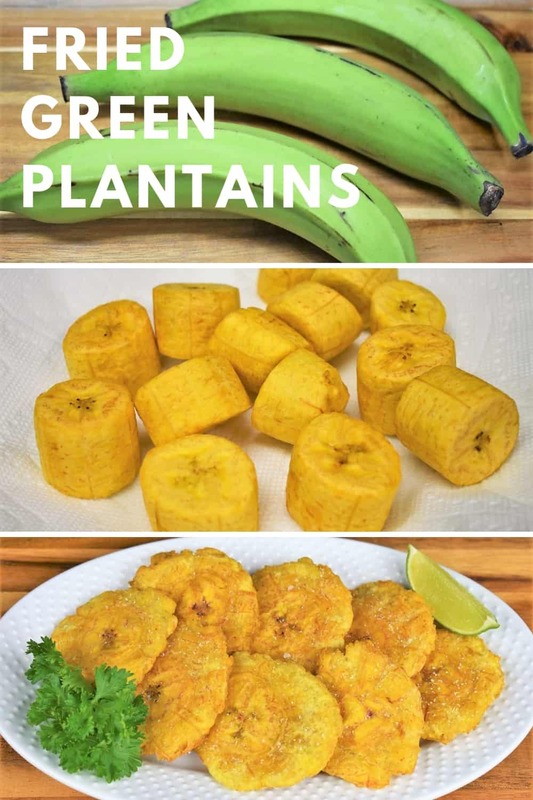 Making tostones requires that the green plantains are fried twice. The first fry gets the plantain cooked enough so it softens and can be pressed down to make the flat disk. Then the flattened plantain is fried again to get it golden and crispy. Add enough oil to a medium pot to cover the bottom by 1 inch of oil. Use a pot that is big enough that when the plantains are added, the oil will not rise beyond the middle of the pot. This is important. If in doubt, use a pot larger than you think you’ll need. Heat the oil over medium-high heat. When the oil is hot, but not smoking, add a test piece. I always use one of the ends to check the oil. If the oil starts bubbling around the plantain, add the rest. For the first fry, you will probably be able to fit all the plantains in the pot (if cooking two). If they don’t fit comfortably, fry in batches. Fry the plantains for 4-5 minutes or until they’re golden. Give them a gentle stir occasionally. Remove the pot from the heat and remove the plantains with a slotted spoon. Place them on a paper-towel lined plate. Keep the pot off the heat, while we wait for the plantains to cool a bit and make the tostones. Fold two paper towels in half. Make sure it’s cushiony, if it’s not, use three. The plantains will be hot, and you want a good layer between the heat and your hand. It’s really important to use good quality paper towels, economy ones will stick to the plantain. Cool the plantain pieces for at least 5 minutes, more if needed. 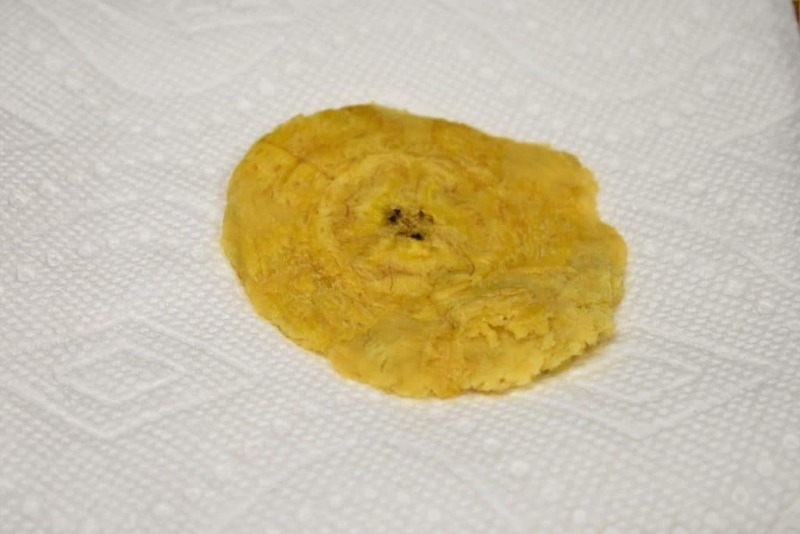 Place the plantain on the folded paper towel. 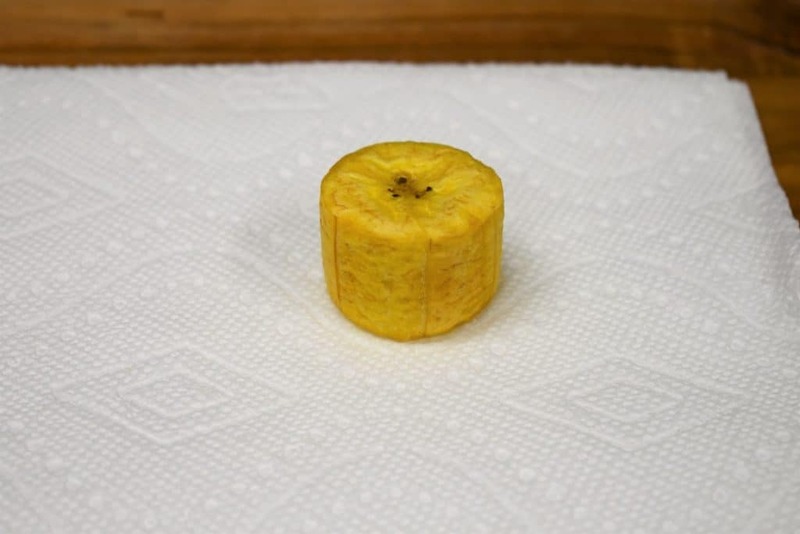 Make an imaginary line down the middle, and place the plantain in the middle of one of the halves. Fold the paper towel over the plantain, using the palm of your hand press down firmly and in one motion. Peel back the paper towel and take a look. If it’s not flat enough, you know you need to press down a little firmer. If it’s too flat and breaking apart, you need to ease up a bit. After a few you’ll be a pro. Once all of your tostones are shaped, place the pot back over medium-high heat. When the oil is hot, but not smoking, add a few at a time. Cook the tostones until they are golden and crispy around the edges. This should take anywhere from 3-5 minutes, move them around gently, occasionally. Remove the tostones and place them on a paper towel lined plate. Sprinkle with salt as soon as they come out of the frying oil. Repeat with the remaining tostones. Serve the tostones with extra salt, limes and hot sauce if desired. Enjoy! 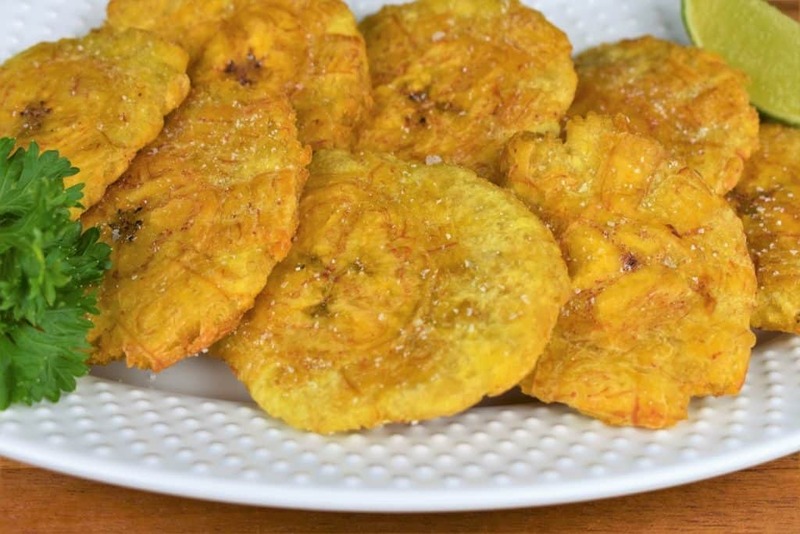 Tostones are fried green plantains; actually they’re twice fried green plantains. Peel the plantain by cutting off the ends and running a knife tip down the plantain, scoring the peel. Using your fingers, get under a piece of the peel and pop it up. Keep running your thumb or finger between the peel and the plantain. 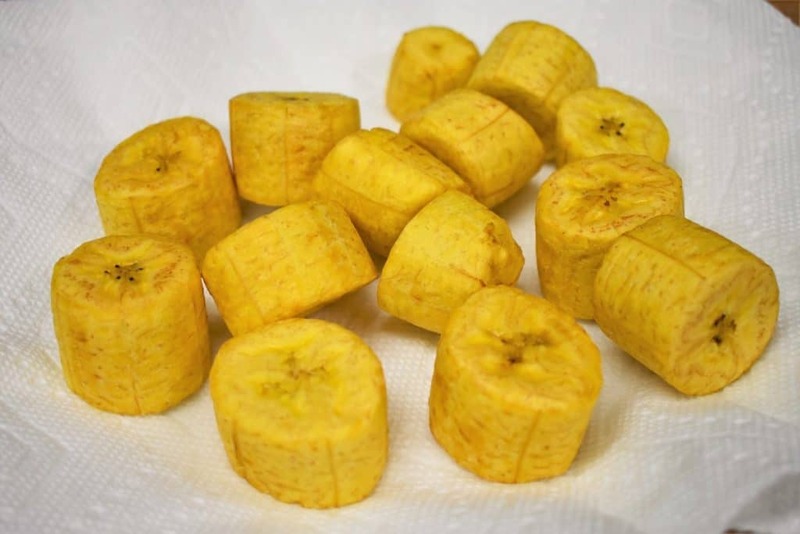 Cut the plantain into roughly 1-1½ inch pieces. Add enough oil to a medium pot to cover the bottom by 1 inch of oil. Use a pot that is big enough that when the plantains are added, the oil will not rise beyond the middle of the pot. Heat the oil over medium-high heat. When the oil is hot, but not smoking, add a test piece. Fry the plantains for 4-5 minutes or until they are golden. Give them a gentle stir occasionally. Keep the pot off the heat. While we wait for the plantains to cool a bit, then make the tostones. Fold two paper towels in half. Make sure it’s cushiony, if it’s not, use three. It’s really important to use good quality paper towels, economy ones will stick to the plantain. Cool the plantain pieces for at least 5 minutes, more if needed. 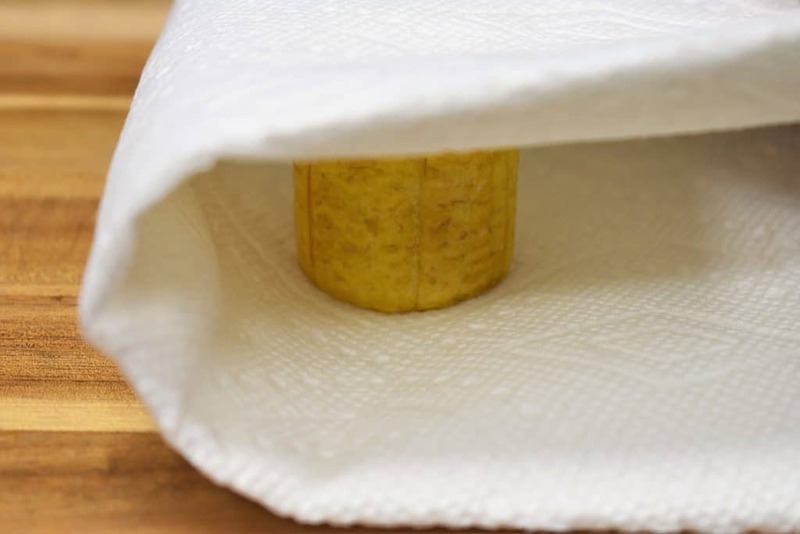 Fold the paper towel over the plantain and using the palm of your hand press down firmly and in one motion. Peel back the paper towel and repeat with the remaining pieces. Once all of your tostones are shaped, place the pot back over medium-high heat. When the oil is hot, but not smoking, add a few tostones. Cook the tostones until they are golden and crispy around the edges. This should take anywhere from 3-5 minutes, move the tostones around gently, occasionally. 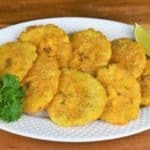 Remove the tostones and place on a paper towel lined plate. Sprinkle with salt as soon as they come out of the frying oil. Repeat with the remaining tostones. Serve with extra salt, limes and hot sauce if desired. Enjoy! Cuban-style beef soup or Sopa de Res in Spanish, is a really easy and affordable way to get a home-cooked, nutritious and delicious meal. For this soup, an inexpensive cut of beef is cut into small chunks. The beef is cooked in a rich and flavorful broth that’s flavored with onions, garlic and a blend of spices. 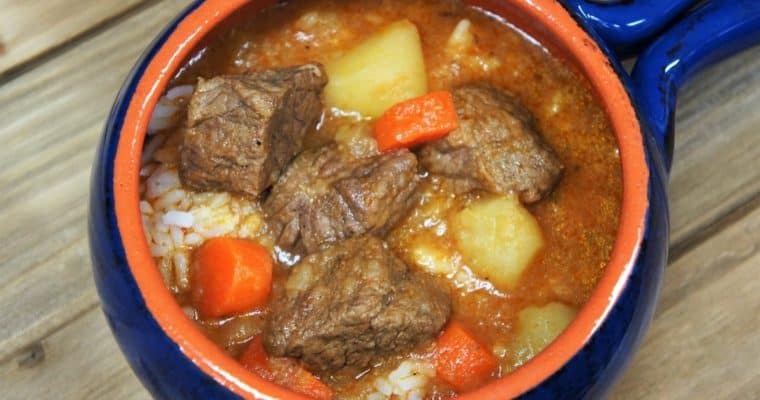 Then we add potatoes and carrots, and of course, like most Cuban dishes we serve it with white rice.